What Are The Health Benefits Of Red Onions? Red onions is a vegetable that is the most widely cultivated species of the genus Allium. It is a very mild and sweet onion among the many different colored onion varieties. 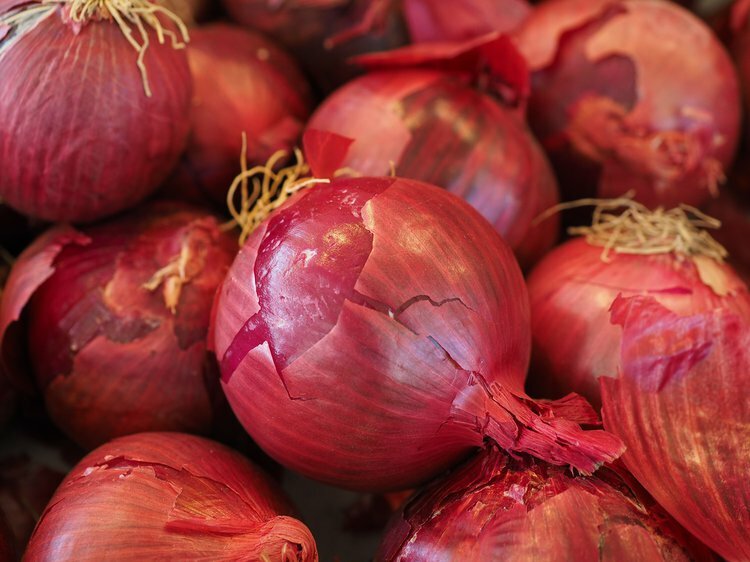 The red onion, or Spanish onion, is a vegetable that is the most widely cultivated species of the genus Allium. Onions generally possess several promising medicinal uses because of the many nutrients, vitamins, minerals, and organic compounds contained in them including sulfuric compounds and quercetin in the essential oils. Red onions have purplish-red skin, a color that is layered through its white flesh. It is a very mild and sweet onion among the many different colored onion varieties. It particularly contains plenty of healthy essential nutrients, as well as phytochemicals that provide long-term health benefits. One of the health benefits of red onions is that it contains antioxidants, called flavonoids. An antioxidant is a compound that scavenges harmful biological wastes that can be detrimental to the cell. The toxic organic wastes, called free radicals, can potentially cause cancer by mutating the DNA. One of the most important antioxidants in red onions is quercetin. Quercetin has been shown to reduce and even prevent the spread of cancer. Quercetin has proven to also help individuals with high blood pressure or hypertension. A study from the University of Utah suggests that quercetin may be linked with a reduced risk of coronary heart disease and stroke. The compound showed no effect on people without high blood pressure. However, on individuals with hypertension, quercetin showed positive results. For individuals with diabetes, red onions possess the mineral chromium, which helps the body manage blood sugar levels and promote a slow and controlled release of sugar into the body muscles and cells. Individuals with earaches can also experience the benefits of onions by adding a few drops of onion juice to improve the condition. Applying onion juice through a piece of cotton wool may cure tinnitus, or the ringing sound in the ear. Quercetin also acts as an anti-inflammatory, which can help prevent long-term inflammation. Short-term inflammation is generally excellent and is the first line of natural defense of the body to fight any foreign invaders. Long-term inflammation, however, can cause various diseases that include heart disease, cancer, metabolic syndrome, Alzheimer’s disease, and various other degenerative conditions. Also, the anti-inflammatory effects can reduce redness and swelling caused by acne. Onion juice mixed with honey or olive oil could be an excellent treatment for the symptoms of acne. When fighting off toxins, onions can help with its rich source of vitamin C. In addition, the phytochemicals present in onions act as a stimulant to vitamin C within the body. Add raw red onions to your next salad or meal to give it an extra kick in flavor and benefit for your body. Abu-Rabia, A. (2005). Herbs as a food and medicine source in Palestine. Asian Pacific Journal of Cancer Prevention, 6(3), 404. Benkeblia, N. (2005). Free-radical scavenging capacity and antioxidant properties of some selected onions (Allium cepa L.) and garlic (Allium sativum L.) extracts. Brazilian archives of biology and technology, 48(5), 753-759. Dorsch, W., Schneider, E., Bayer, T., Breu, W., & Wagner, H. (1990). Anti-inflammatory effects of onions: inhibition of chemotaxis of human polymorphonuclear leukocytes by thiosulfinates and cepaenes. International Archives of Allergy and Immunology, 92(1), 39-42. Edwards, R. L., Lyon, T., Litwin, S. E., Rabovsky, A., Symons, J. D., & Jalili, T. (2007). Quercetin reduces blood pressure in hypertensive subjects. The Journal of nutrition, 137(11), 2405-2411.
ischemia and reperfusion-induced cerebral injury.Fitoterapia, 79(2), 86-96. Kanlayavattanakul, M., & Lourith, N. (2011). Therapeutic agents and herbs in topical application for acne treatment. International journal of cosmetic science,33(4), 289-297. Mathew, P. T., & Augusti, K. T. (1974). Hypoglycaemic effects of onion, Allium cepa Linn. on diabetes mellitus-a preliminary report. Indian journal of physiology and pharmacology, 19(4), 213-217. Prakash, D., Singh, B. N., & Upadhyay, G. (2007). Antioxidant and free radical scavenging activities of phenols from onion (< i> Allium cepa</i>). Food chemistry, 102(4), 1389-1393. Eldin, I. M. T., Ahmed, E. M., & HM, A. E. (2010). Preliminary study of the clinical hypoglycemic effects of Allium cepa (red onion) in type 1 and type 2 diabetic patients. Environmental health insights, 4, 71. Corea, G., Fattorusso, E., Lanzotti, V., Capasso, R., & Izzo, A. A. (2005). Antispasmodic saponins from bulbs of red onion, Allium cepa L. var. Tropea.Journal of agricultural and food chemistry, 53(4), 935-940. Dini, I., Tenore, G. C., & Dini, A. (2008). Chemical composition, nutritional value and antioxidant properties of Allium caepa L. Var. tropeana (red onion) seeds. Food chemistry, 107(2), 613-621. Petersson, E. V., Liu, J., Sjöberg, P. J., Danielsson, R., & Turner, C. (2010). Pressurized Hot Water Extraction of anthocyanins from red onion: A study on extraction and degradation rates. Analytica chimica acta, 663(1), 27-32. Wang, S., Melnyk, J. P., Tsao, R., & Marcone, M. F. (2011). How natural dietary antioxidants in fruits, vegetables and legumes promote vascular health. Food Research International, 44(1), 14-22. AbouZid, S. F., & Elsherbeiny, G. M. (2013). Increase in flavonoids content in red onion peel by mechanical shredding. Journal of Medicinal Plants Research, 2(9), 258-260.